: This is one of the most frequently asked questions I get and the last time we answered it was two years ago. Hi I’m a beginner, I love your videos, but where should I start? Which video should I do first? Is there an order that I should do your beginner videos? There are so many beginner videos! I would still recommend you start with Namaste Yoga 101, Namaste Yoga 101. This was the first beginner class I created and it goes over the basics of what to expect in a yoga class as well as some of the most standard postures in a yoga class. Another great yoga class to start with is our Absolute Beginner Yoga class, Namaste Yoga 268. 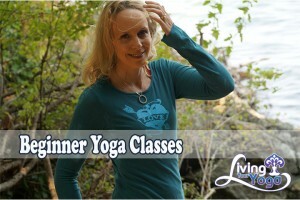 This is a class you can do if you have never done yoga before with tones of modifications. I will give you slow, easy to follow, step-by-step instructions and tell you exactly how to get in and out of each and every pose. Detailed instructions will be given for even the most basic poses and how to breathe. You will be given lots of cues of how to pay attention to your body and where to feel the effects of the yoga poses. You do not have to be athletic, flexible, strong, balanced, skinny or coordinated to do this class. The slow, step-by-step instructions will give you the confidence to let go of your self-judgment and stay focused with commitment and motivation. From there I would recommend doing the beginner’s series. This series of seven classes goes through the poses as they appear in classes from preparatory poses, standing postures, inversions, backbends, twists and forward folds and then it puts it all together! After that I suggest after you go through the beginner’s series you go through some of the more important concepts of yoga as laid out in the following beginner yoga classes. Namaste Yoga 250 teaches you how to set your intention for your yoga class. Namaste Yoga 251 will teach you to figure out how far you should go in the pose. Finding that just right place between too much and too little experience in a yoga posture can make a huge difference between your yoga class seeming too easy, too hard or too boring and makes you your own best teacher. It is up to you to find the position in your body where you are fully engaged – that is experiencing sensation in your body – something is happening – whether you are doing the pose for the first time or the millionth time. After that, go back to the beginner classes starting from episode 153 to 159 which focus on teaching specific poses. 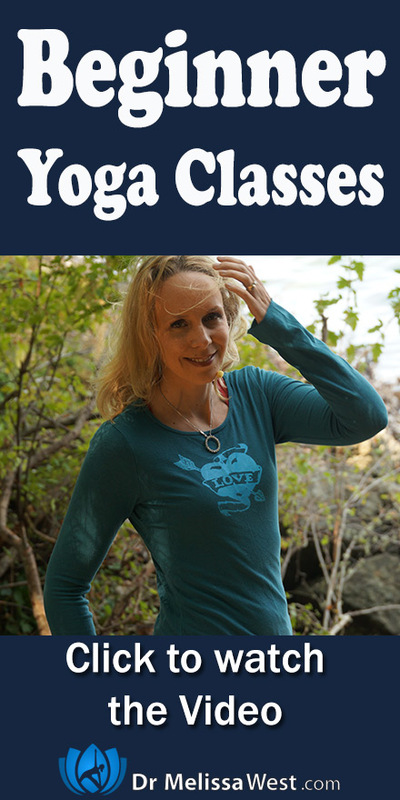 These classes will teach you mountain and tree pose, downward facing dog, bridge and shoulder-stand, triangle pose, warrior one and three, warrior two and side angle, and cobra pose. Once you have learned all the poses you are ready for sun salutations. This class will teach you how to do sun salutations step by step, pose by pose. From there I would recommend trying some of our most requested yoga classes for beginners. Do you have trouble finding time for yoga? Namaste Yoga 107 is for you. It will help you overcome your objection of not having enough time for yoga. Do you struggle with staying motivated and consistent with your yoga practice? Then Namaste Yoga 275 on Discipline is a great class to help you stay motivated, focus and consistent with your yoga practice. If you find you keep getting pulled in a hundred different directions in your life and are continually responding to external demands then this class on Focus: will help motivate you to help you get back to your yoga mat. Beyond that I highly recommend our membership community where we have monthly motivation meetups to help you stay motivated to practice your yoga daily. In our motivation meetups I teach you one new motivational tool a month, we review our previous month and set goals for our coming month. We also have a yoga buddy system in our membership community to help you stay motivated and consistent with your yoga practice. Many beginners want help with balance and so I created this beginner yoga class on balance to help with balance. If you would like help with flexibility I have a beginner yoga class for flexibility and also another beginner yoga class for strength. One question I get asked a lot is about weight loss and so I created a beginner’s yoga class on weight acceptance. Some final free beginner yoga classes to check out are our beginner Step by Step yoga class and our beginner Easy to Follow yoga class. Namaste Yoga 117 is a great beginner’s class that will help you if you spend a lot of time sitting. Last but not least is a class that means a lot to me personally, Namaste Yoga 253, which is a class designed to end violence against women. It is a beautiful project created to instigate massive change in our world, and it is a beginner level class. So what should you do once you have completed all our beginner level classes? Well, once you have completed all our beginner level classes, we have more in depth posture by posture and breath practices in our membership community in our posture and pranayama section. There we offer you the leading edge research and innovation in the fields of fascia, brain yoga and neuroplasticity to bring you easier and more significant gains in your flexibility with less time and effort. We use specialized props such as the slo mo ball, soft foam roller and soft squash ball to make huge gains in your flexibility yoga posture by yoga posture.